Reproduced from “Heimatstimmen: Ein baltisches Hausbuch”. - Reval: Kluge; Leipzig: Hartmann, 1912. - Bd. 5.- S. 185. The son of a peasant from the Jaunpils volost’ (region) of the Rizhskyuyezd (province), Purvītis showed an early talent for drawing, first while studying at a parish school and later at a municipal school. He became a non-matriculated student at the Academy of Fine Arts in 1890, where he developed an interest in the landscape genre, which naturally led him to Kuindzhi's landscape workshop. During his years at the Academy, while mastering his professional skills, making his a living by doing odd jobs, and participating in a semi-legal organization of Latvians in St. Petersburg known as “Rukis" (Dwarf), Purvītis also familiarized himself with prominent works by Russian artists from outside the Academy, including the “Peredvizhniki" (Wanderers) and other new trends of the period, as well as with the tradition of Western European landscape painting, exemplified in works from the collections of the Hermitage and the Kushelev Gallery of the Academy Museum. Purvītis came to greatly appreciate the landscapes of Claude Lorrain and the Dutch “Golden Age" masters, whom he continued to admire after finishing his education. As a professor at the Latvian Academy of Fine Arts in his later life, he advised his students to master the craft of composition by studying the French master and to learn how to depict foliage from Jacob van Ruisdael's landscapes. 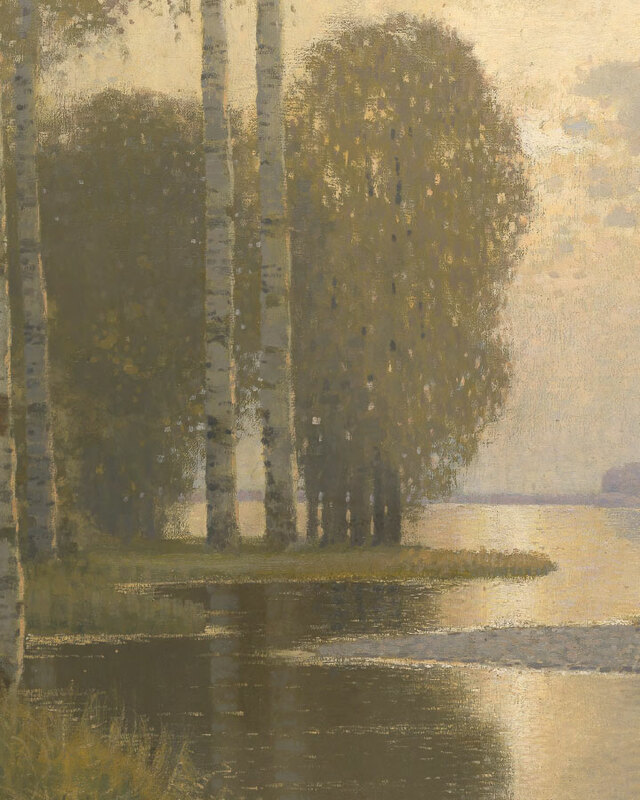 As for Russian painting, Purvītis is known to have copied the landscapes of Fyodor Vasilyev, while his early works, as might be expected, were influenced by Kuindzhi and Isaac Levitan. The focus of this article is to try to explain just what Kuindzhi, as head of the landscape workshop, taught Purvītis, and how this education proceeded. 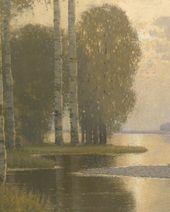 Judging by the accounts of his contemporaries (printed in Mikhail Nevedomsky's monograph), as well as the detailed, emotional and reliable memoirs of Arkady Rylov, Purvītis's fellow student at the landscape workshop, it was a very liberal institution without a rigid curriculum or system. Never forcing his style on his students, Kuindzhi proposed “individual lessons" for everyone. Purvītis himself recorded little about his life, but in a brief autobiographic sketch written later in life, he portrayed his teacher as a very nice person, “able to keep the spirits up, even when hopes are vanishing" - in other words, he characterized him as a mentor with the ability to en- courage. Kuindzhi certainly used to take care of his students and help them, as is well known from his siding with them in the conflict between students and the administration of the Academy in 1897. At the same time, there is no doubt that Kuindzhi was influential not only on account of his personal qualities but also artistically. His students loved him and heeded his advice, and he certainly put some of his own artistic principles into their heads - such as sketching en plein air in a natural setting but producing the finished landscape piece “from inside yourself", from memory, and making sure that the piece had “interiority". This is evident in the art of the “Kuindzhists", a group of very different individuals working in the late 19th and early 20th centuries, who nevertheless had much in common conceptually. Kuindzhi certainly owed much of his paradoxical “non-systemic" influence to the context in which he worked, and to his role in the development of Russian art in the late 19th century. By all accounts, he was no narrow-minded dogmatist, and his advice to his students was not guided by dogmatic beliefs. Rylov reminisced: “His [Kuindzhi's - E.K.] manner of speaking was usually fitful, incoherent, and his conversations were lacking a clear thread, but made you understand what an artist should strive for in his compositions, and how to incubate a composition by carefully thinking it out." The creation of landscape paintings was undoubtedly a subject that featured prominently in these conversations, but one is led to think that the professor owed his influence primarily to his role as a herald of the modernist Art Nouveau at the turn of the 20th century in an environment otherwise defined by academicism. The qualities that attracted the young to Kuindzhi undoubtedly included his innovation in the fields of colour and light, his generalized simplification of forms, as well as his romanticist leanings in the choice and interpretation of the motifs of nature: such sensibilities were noticed early on by Alexander Rostislavov and, much later, by Vitaly Manin. 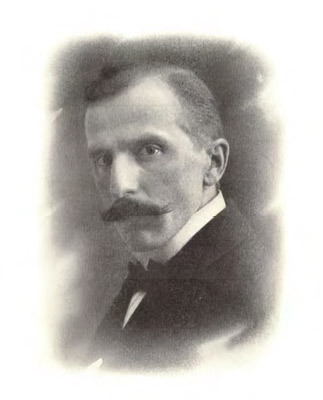 Janis Rozentals, Purvītis's friend and kindred spirit at that time, published a review of Russian painting in 1903-1904, in which he succinctly characterized Kuindzhi as “one of the first [artists] whose objective was not to produce an image of photographic likeness but to capture impressions through light and colour." Purvītis aspired to such goals too, “taking individual classes" in Kuindzhi's workshop and keenly noting everything going on both among his fellow students and in Russia's wider artistic life, and staying tuned to the “new art" then in the making. His sources of inspiration, if not exactly emulation, were fairly diverse. 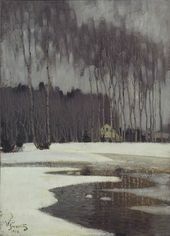 In addition to the then new generation of the “Peredvizhniki", Purvītis was certainly familiar with the landscapes of Isaac Levitan, who was already widely popular at that time: the fact that Purvītis's early pieces were influenced by the great Russian lyrical artist was noticed by nearly everyone who observed his development, beginning with Rozentals, who devoted a 1903 article to the subject. 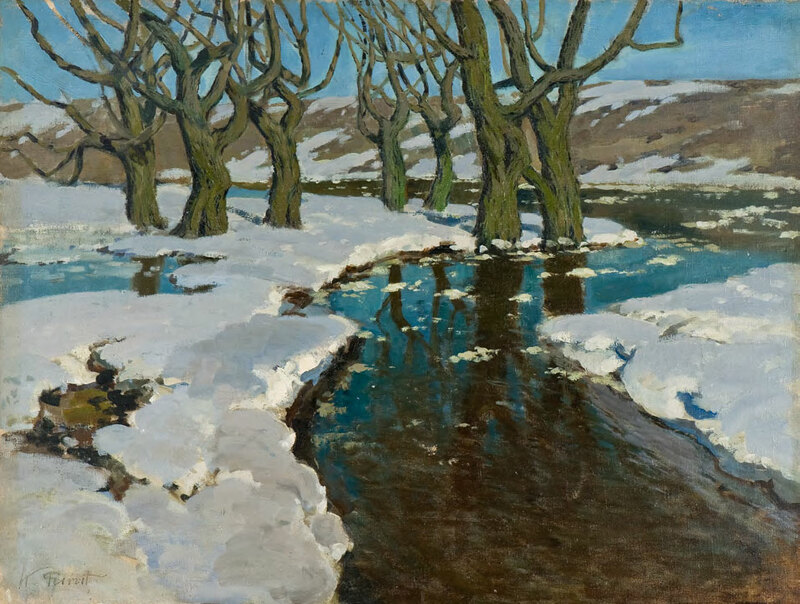 The “new art" of Western Europe was not so easily accessible, although Kuindzhi's students, during their time at the Academy, sometimes had a chance to look at it: Rylov recalled two “wondrous landscapes" by the Paris- based Norwegian painter Frits Thaulow, which he and his friends were able to appreciate in the studio of the professor Nikolai Kuznetsov. At a show of French art in 1896 in St. Petersburg, several pieces by the Impressionists were presented alongside numerous works in an academic style. Such current innovative trends could also be studied less directly: as a participant of the “Rukis" society, the sculptor Gustavs Skilters recalled how his fellow members read with delight the first edition of “The History of Painting of the 19th Century" (1893-1894) by Richard Muther, a critic who unstintingly publicized a wide range of popular works associated with the innovative trends of European art, from Impressionism to Symbolism. German art magazines, too, were accessible to members of the society since they knew the language. During his years at Kuindzhi's workshop, Purvītis sketched from nature constantly, looking for his version of the new, neo-romanticist, pictorial and colourful “mood landscape". 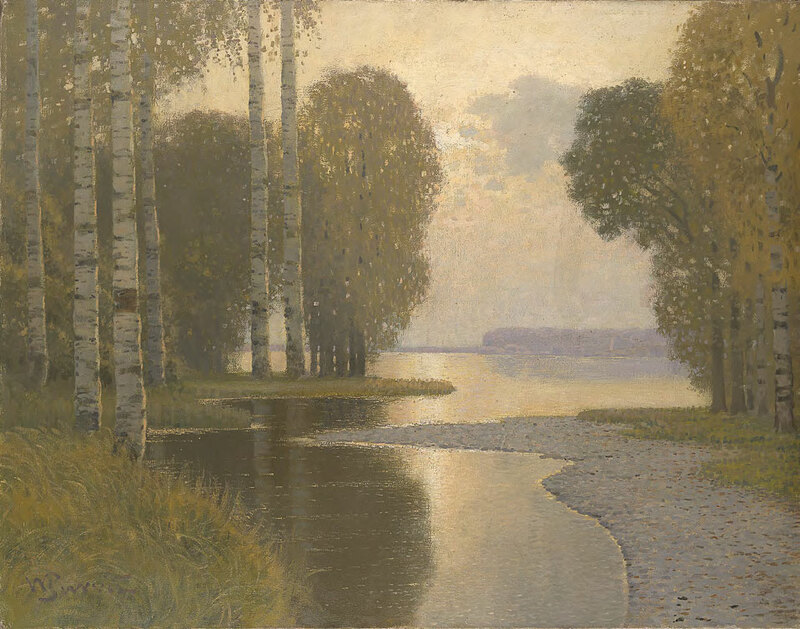 Although he was still sometimes employing landscape and traditional staffage elements typical for socially sensitive realism, Purvītis understood and accepted, both then and later, the aesthetics of the everyday, which underlined his choice of plain motifs for his landscapes (“Spring Landscape. 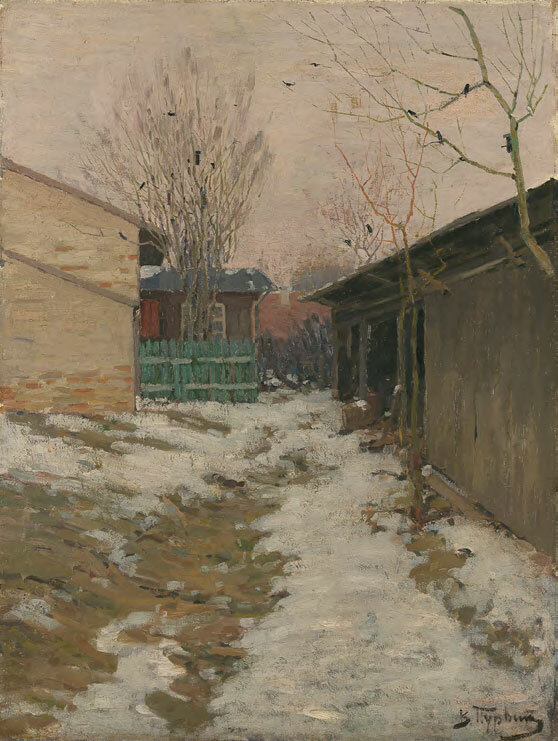 A Little Courtyard", mid-1890s, Latvian National Museum of Art (LNMA)). But, in general, landscape was no longer associated for him with some socially ethical “truthfulness", much less an expression of “civil sorrow" in the spirit of the “Pered- vizhniki". Nevertheless he tried to combine the tradition of social realism with the light-and-colour effects that he derived from Kuindzhi. For instance, in his obviously “staged" composition, the laconic “Winter Evening" (mid-1890s, LNMA), Purvītis placed two glum-looking women - peasants or church-goers - clad in black in the foreground of an empty, snow-covered, pale-blue field. 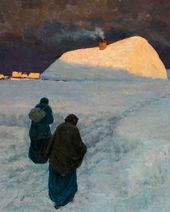 They are plodding towards some peasant huts that are buried in snow and illuminated with the rose- and orange-coloured light of the evening sun, which stands in sharp, almost theatrical contrast to the dark-brownish sky that is completely dominated by heavy clouds that are almost identical to those in Kuindzhi's landscape “After Rain" (1879, Tretyakov Gallery). Oil on canvas. Location unknown. Colour reproduction: Information Centre of the Latvian Academy of Fine Arts, Riga. P-6. “Truthfulness", albeit without any strong social connotations, remained in his most mature student work, the landscape “Last Rays of the Sun" (1897, present whereabouts unknown, previously held at the Museum of Fine Arts, Novgorod the Great), that he created for an 1897 competition. 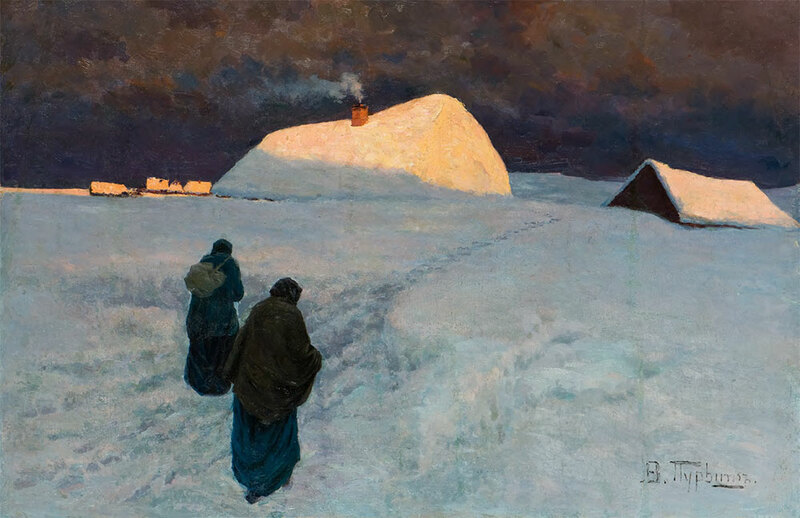 Purvītis introduced the elegiac motif of the final rays of twilight - the “golden hour" that was such a favourite of painters of different European schools at the turn of the 20th century - into an otherwise unwelcoming rural scene: a panoramic view, seen from a high vantage point, of deserted hills with solitary patches of unmelted snow and bare trunks of sickly trees, with a small village church by a wide river or lake, and the horizontal strip of its distant bank, enlivened only by clusters of small buildings. 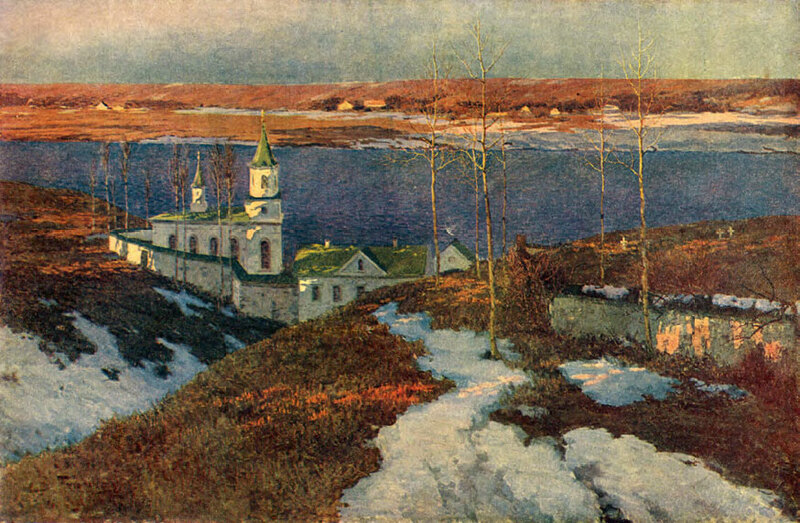 This piece can be compared with Levitan's “Evening Bells" (1892, Tretyakov Gallery), which features a church and the last rays of the setting sun in a similar fashion. However, it is the differences between the two works that indicate the influence of the above-mentioned “Kuindzhi paradigm": the landscape's colour scheme is based on clear and sharp colour contrasts - the shaded brown hills, the rose reflections of the light, and the smooth dark-blue surface of the water. The work combines obvious lyricism with the epic sweep of its neatly arranged composition, reminding us of the many spacious, horizontally structured compositions of Purvītis's teacher; the almost ideal straight line of the horizon evokes the similarly clear-cut dividing line between earth and sky in Kuindzhi's landscapes. 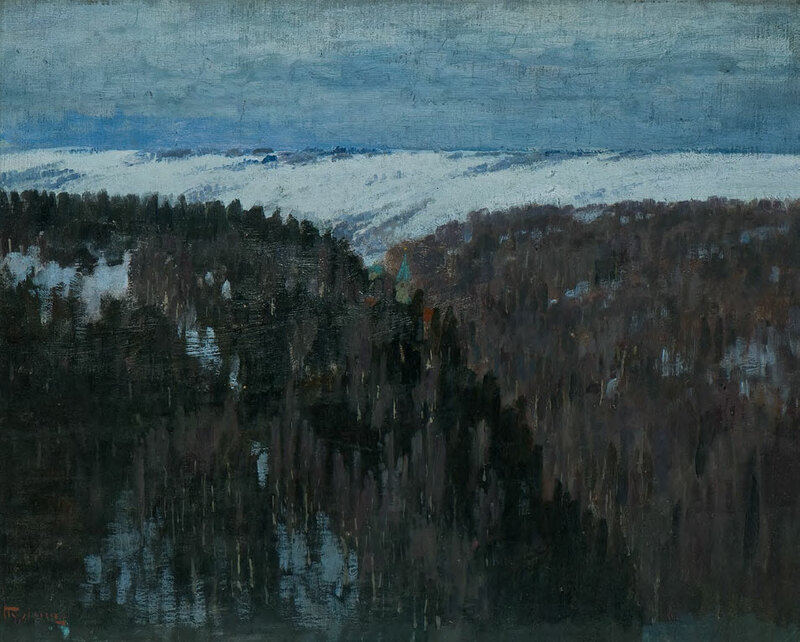 Purvītis's competition piece also revealed an individual touch in his treatment of compositional structure in landscape, something that became typical for his later works: the protuberances and planes of hills, streams and shoreline occupy the larger portion of the picture, with the horizon line placed high. In the years that followed, the artist regularly employed this compositional scheme which has been described by Tatjana Kacalova as his “earth composition". In addition, the repetitive vertical and horizontal formats of figurative forms were now revealing such features as an orthogonal structure typical of Purvītis's approach to composition, one that always restrained the dynamics and touch of drama in various motifs, as well as contrasts of colour and texture. This graduation work, created under Kuindzhi's mentorship, can thus be regarded in many ways as the starting-point from which Purvītis's distinctive style would begin to develop. As for his place among the Kuindzhists, his neo-romantic images, as already noted, are not dissociated from the materiality of the nature he studied. In this respect, he remains closer to Arkady Rylov or Ferdynand Ruszczyc than to the freer style of artists such as Nicholas Roerich and Konstantin Bogaevsky. 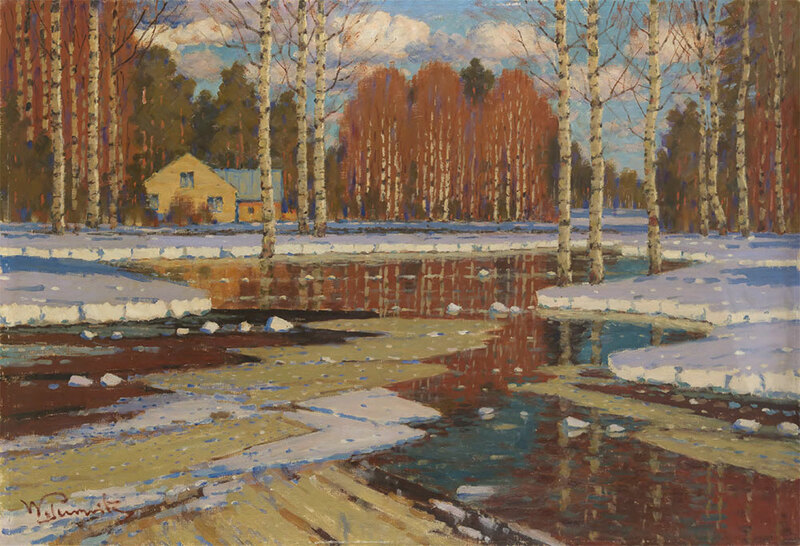 The painting won the competition gold medal for Purvītis, as well as a study trip abroad, and became a landmark event in his personal life, too. Among those who had taken notice of him were not only the members of the Academy Council but also European celebrities such as Anders Zorn and Albert Edelfelt, who were then visiting the institution: according to an unsubstantiated story related by Rozentals, their opinion swayed the Council in Purvītis's favour. Sergei Diaghilev met with him too, inviting him to participate in a show of Russian and Finnish artists, as well as at the exhibitions of the “World of Art" movement. As Rozentals put it, Purvītis became the “hero of the day" on the art scene of St. Petersburg, and his popularity among art aficionados and critics grew. After a visit to Paris in 1898 in the company of Kuindzhi and the Kuindzhists, he returned to that city on a fellowship to spend five months familiarizing himself with new tendencies in art, before moving to Munich to pursue similar interests. 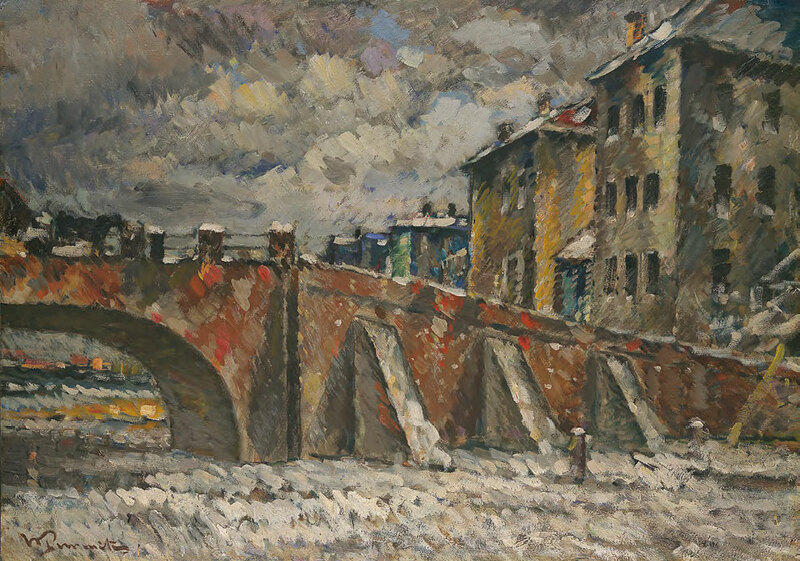 Exhibiting in Berlin, Munich and Vienna, he continued to travel around Europe in the early years of the new century, with a succession of solo shows in German cities. 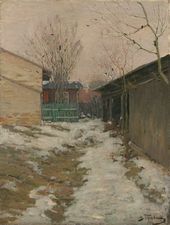 Before 1900 he participated in the academic Spring Exhibitions in St. Petersburg, and also showed his landscapes at the “World of Art" shows prior to 1903. His popularity in his homeland grew, and in 1899 Purvītis moved back to live in Riga, where he displayed his works at the salon of the city's artistic society. 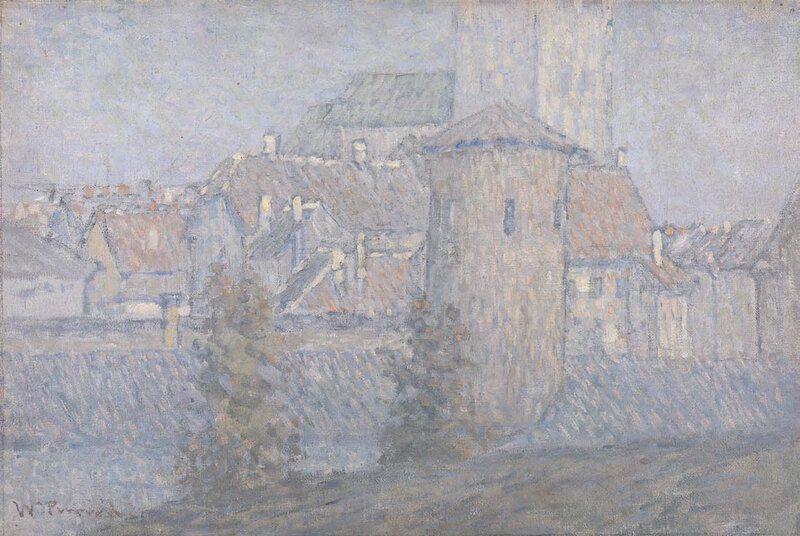 At the turn of the century the artist was at the peak of his creative form in his application of his “mood landscape" formula: he had not yet succumbed conceptually to the lasting appeal of Impressionism. 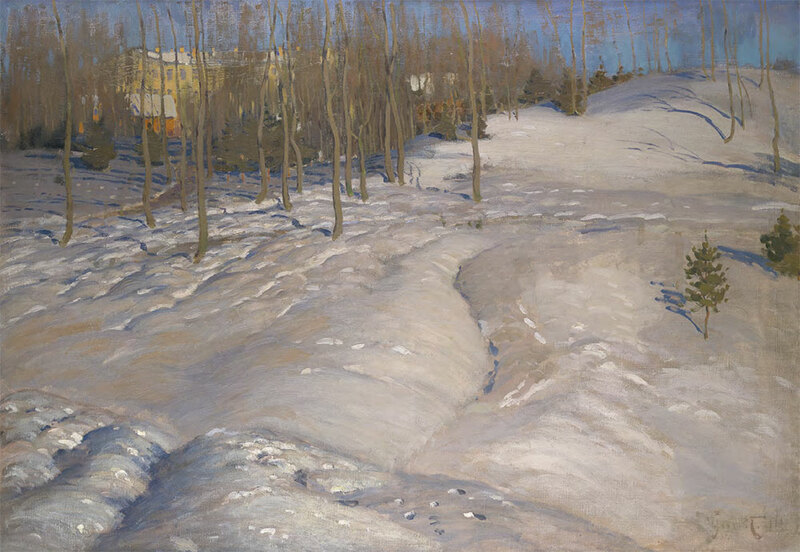 He would spend hours outdoors studying nature en plein air before returning to his workshop, where he would synthesize his emotionally charged images of the Latvian landscape. His neoromanticist aesthetics captured nature's perennial and spontaneous life, the waxing and waning of the seasons and the changing times of the day, the dynamics of light, water, wind and clouds, and the flora - the birch-tree groves and pine-tree forests - of his homeland, with its motifs of rivers and brooks; heaps of winter snow are followed by the thaw and flowering of spring, which itself gives way to the colourful foliage of autumn. This growing sense of the picturesque, alongside an emphasis on colour, was gradually supplemented with elements of biomorphic Art Nouveau stylization that is characteristic of Jugendstil. In those years Purvītis completely broke away from academic traditions, and his connection with Kuindzhi appeared to weaken, too. He was becoming increasingly more interested in the restrained lyricism of the Scandinavian masters, such as Thaulow or Gustaf Fjaestad; in similar motifs in the art of the German painters associated with the so-called “Heimatkunst" school - the Worpsvede artists, and the Berlin artist Walter Leistikow; and in the sfumato compositions of the “Glasgow Boys", who were so popular at the time. 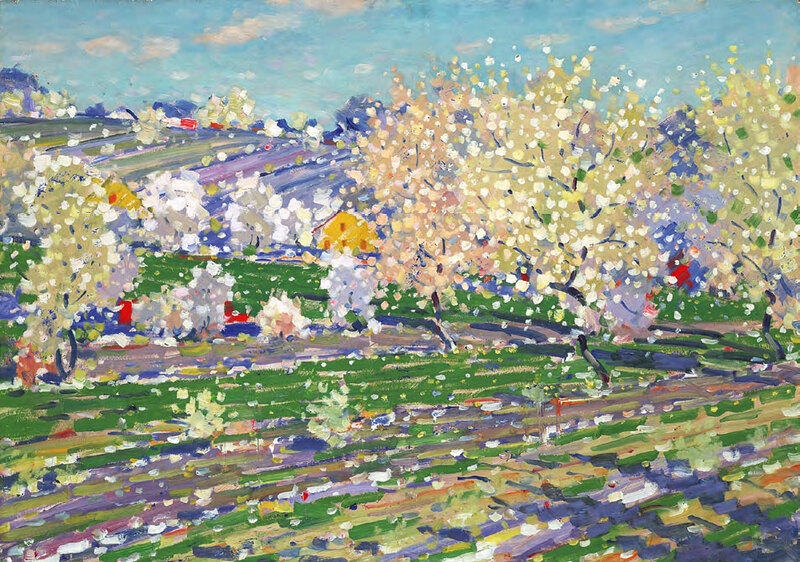 Living in Reval (Talllinn) from 1907 to 1909, he produced paintings featuring figurative forms that melted into light and air, and mastered the techniques of neat brush strokes and of separating local colours, thus coming close to French Impressionism. However, the art Purvītis created during the next stage in his creative career, after his return to Riga in 1909, again recalls Kuindzhi. Purvītis was no longer interested in the dematerialization of figurative forms in the manner, say, of Claude Monet's late works. 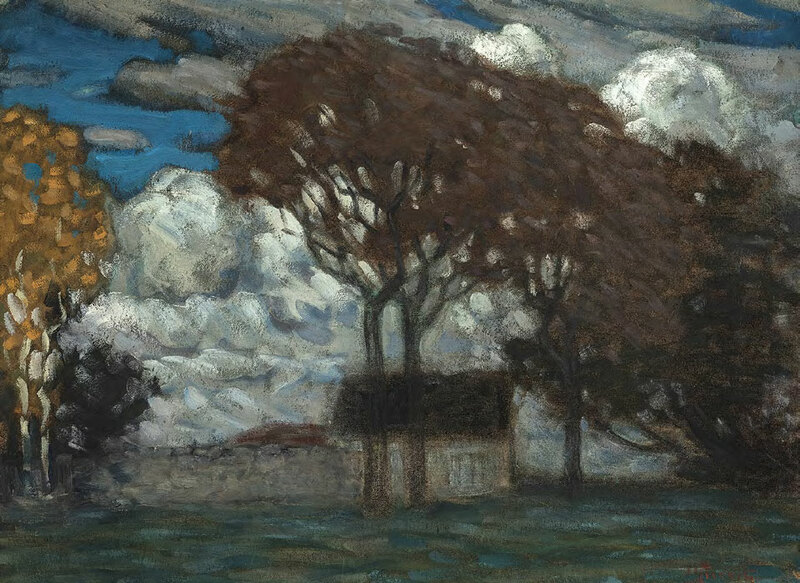 Rather he was solidifying and bringing ever more stability to the orthogonality of his landscapes, and turning the technique of neat brush strokes and polychromy of tone sensitive to outdoor lighting into a more rational, postimpressionist, condensing and decorative system. At the same time he was strengthening his neatness of forms, creating what might be called a hidden neo-classicism. 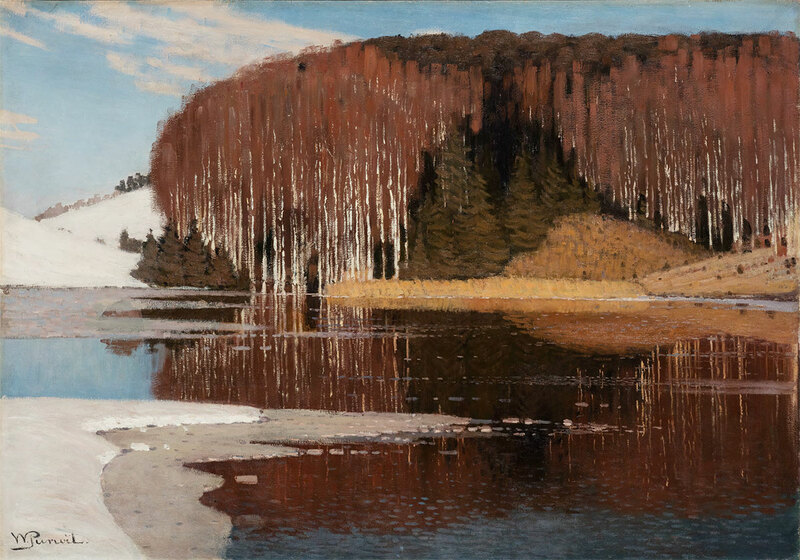 The paintings feature even more sweeping panoramas than before, taking in smooth surfaces of water, earth and sky, with tall and straight birch trees, like classic columns, in the foreground, as well as uniformly round crowns of trees and “regular" masses of underwood or softwood forests. 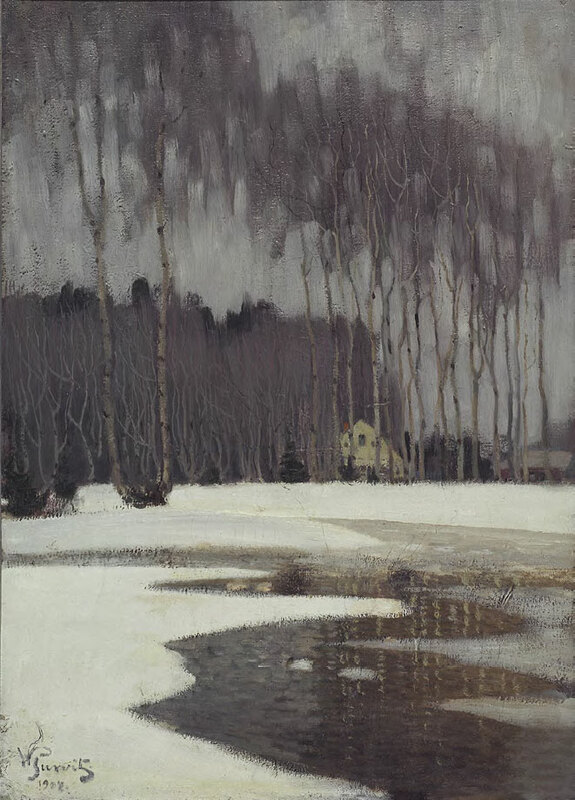 They are sometimes placed ceremoniously in the centre of the composition (“Winter", c. 1910, LNMA) or form its wings, opening up distant vistas (“Landscape with Birch Trees", early 1910s, LNMA). 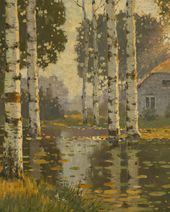 That latter composition, like many other similar pieces, evokes the versions of Kuindzhi's “A Birch Grove" (1879, Tretyakov Gallery and the National Art Museum of the Republic of Belarus, Minsk), which feature a similarly balanced composition, with a symmetrical arrangement of birch trees in the foreground, and abstractly circular silhouettes in the distance. 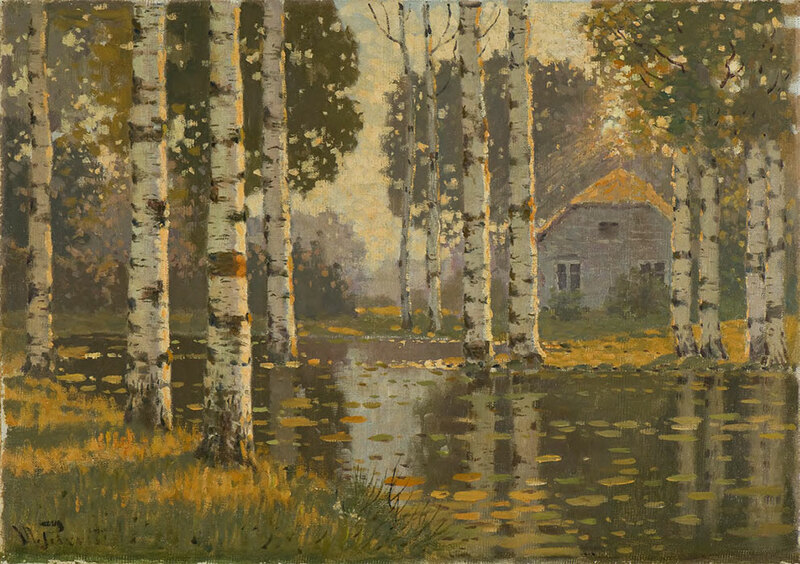 Purvītis's kinship with these landmark images by his teacher becomes especially obvious in a composition where side-lighting plays up the pillar-like tree trunks, “A Pond with Birch Trees" (c. 1910, LNMA). The method of creating landscape pieces, inspired by Kuindzhi's advice, was taking firm root in Purvītis's mind and practice. One art aficionado and admirer of Purvītis's talent who praised his works in his writings and often visited the artist's studio, Baron Otto Roderich von Engelhardt, has left behind a description of his method: the artist would first capture an abstract “pictorial idea" - a non-figurative sketch matching the theme behind it; then, as the work on the landscape proceeded, the colour spots would change places and move around, turning into figurative forms whose proportions were fitted into a well-balanced composition. It goes without saying that the artist painted such figurative forms relying on the numerous sketches that he had made outdoors. The clear separation between the two stages of the creative process - studying the material world in situ, then creating the painting “from inside yourself", as Kuindzhi used to say - remained a key artistic principle for Purvītis in the years that followed as well. 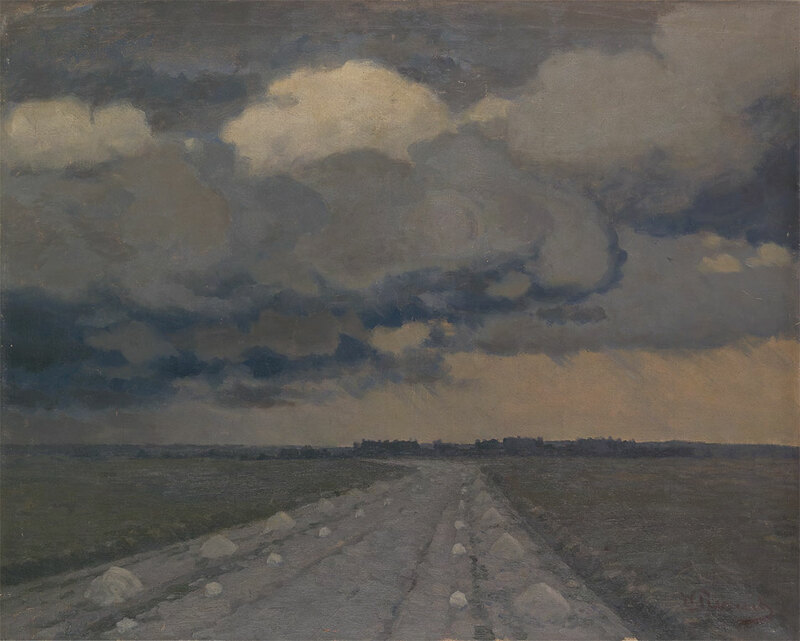 Purvītis's artwork in his final period, from the late 1910s until his death in 1945, does not betray the influence of Kuindzhi so strongly, something that is understandable considering the continuing evolution of the Latvian painter. 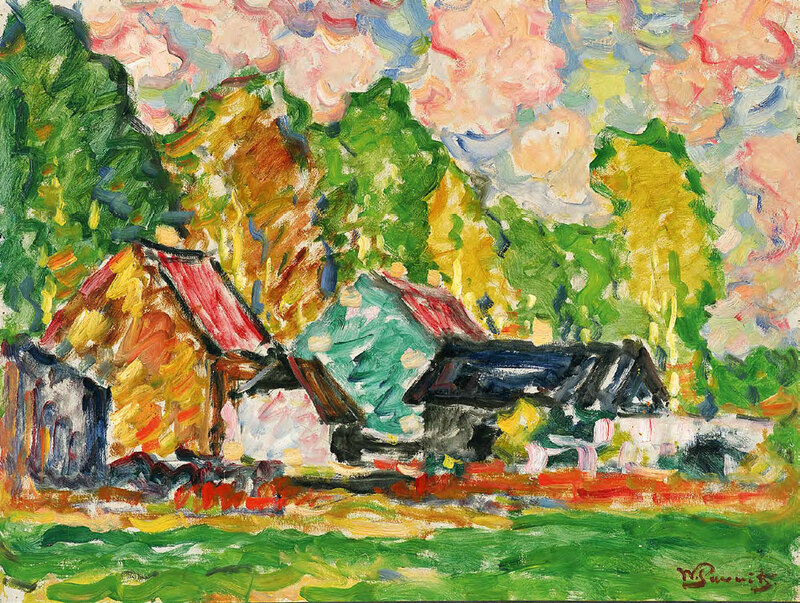 Despite his busy schedule as dean of the Latvian Academy of Fine Arts (and the head of its landscape department) and a member of various cultural commissions, Purvītis continued to work prolifically, producing both traditional landscapes of Latvia that drew on his past experience and also experimental compositions in the vein of either the Post-Impressionism and Fauvism of Paris, or of Expressionism. In the interwar period, the general vector of the development of Latvian art was defined by the ideas and practices of classical Modernism, and its radical champions certainly rejected the legacy of the 19th century. While he was undoubtedly a participant in this process of modernization, Purvītis nevertheless recognized, in his own words, only evolution, not revolution in art, and would return to the past in search of sources for inspiration, if not for influence. Arkhip Kuindzhi, we presume, remained one such source of inspiration, and a photograph of his teacher stood on a table in Purvītis's apartment in Riga. For most essential written sources relating to Purvītis’s life and art, see: R. [Rozentals J.]. ‘Par Vilhelmu Purviti un vina makslu’ // “Verotajs”. 1903. No. 1. Pp. 109-119. Illyne, M. ‘The Russian Painter V. Pourvit’ // “The Studio”. 1905. No. 142 (January). Pp. 285-290; Engelhardt, R. von. ‘Wilhelm Purvit: A Baltic Artist’ // "Heimatstimmen: Ein bal- tisches Hausbuch". Reval: Kluge; Leipzig: Hartmann, 1912. Bd. 5. P. 184-200; Prande, A. ‘Akademikis prof. Vilhelms PurvTts’ // “Ilustrets Zurnals”. 1925. No. 12. Pp. 345; Purvits, W. ‘Mein Weg zur Kunst’ // “Ostland”. 1942. No. 1. Pp. 20-24; Berzins, A. ‘Vilhelms Purvītis dzTve un darba’ // “Latvju Menesraksts”. 1942. No. 3. Pp. 245-260; KaCalova, T. “Vilhelms Purvītis”. Riga: Liesma, 1971; “Vilhelms Purvītis. 1872-1945” / Sast. I. Rinke, rakstu aut. D. Lam- berga, A. Braslina, M. Lace, I. Pujate, E. Kjavins un J. Vijja. RTga: Neputns; Jumava, 2000; Kjavins, E. “Vilhelms Purvītis”. RTga; Neputns, 2014. Kacalova, T. “Vilhelms Purvītis”. P. 189. Silins, J. “Vilhelms Purvits”. 1944. (Manuscript from a private archive). P. 16. Nevedomsky, Mikhail; Repin, Ilya. “A.I. Kuindzhi”. St. Petersburg, 1913. Pp. 114-125. Rylov, Arkady. “Memoirs”. Leningrad, Moscow, 1940. P. 54. Hereinafter - Rylov. Rostislavov, Alexander. “Kuindzhi”. St. Petersburg, 1914. Manin, Vitaly. “Arkhip Ivanovich Kuindzhi”. Leningrad, 1990. P. 70. R. (Rozentals, J.). “On Vilhelms Purvītis and His Art”. P. 110. Skilters G. Par “Ruki”. Rokraksts [B. g., b. v.] P. 25. Manuscript, LNMA, memorial collection of Gustavs Skilters. The piece was presumably lost during World War II: several colour reproductions of fairly good quality have survived. Kacalova, T. “Vilhelms Purvītis”. P. 177. Manin, Vitaly. “Kuindzhi”. Moscow, 1976. P. 163. “The Palette of Life. The Correspondence of Janis Rozentals”. Riga, Pils, 1997. P. 139. Engelhardt, R. von. “Wilhelm Purvit: A Baltic Artist”. P. 190. We know this from an account of his student Arvids Egle, who visited his professor in the 1930s. See: Egle, A. “Recollections about Professor Vilhelms Purvītis”. Information Centre at the Latvian Academy of Fine Arts, Professors’ Academic Works Fund. Pp. 29-30. Interestingly, Janis Rozentals kept a photograph of Kuindzhi (now held at the Museum of Literature and Music in Riga) as well, while another of Purvītis’s friends - the painter Johans Valters, who graduated from Vladimir Makovsky’s workshop in 1897 and later emigrated to Germany - had Kuindzhi’s photograph on his desk in his Berlin apartment, calling Kuindzhi his teacher. See: Abele, K. “Johans Valters”. RTga, Neputns, 2009. P. 79.